Winger who made a handfull of appearances for St Albans. Signed for Lewes in June 2003 from Harrow Borough. Wide midfielder or defender, Dwain rejoined Boro’ on transfer deadline day 2003 from Chesham United where he had been a regular for most of the season. Also played for Aylesbury United and Hayes. 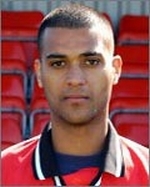 Moved up to join Aldershot Town in November 2004 but then returned to Lewes in July 2005. However, his return to Lewes was a very brief one before a move to Canvey Island followed less than a month later.